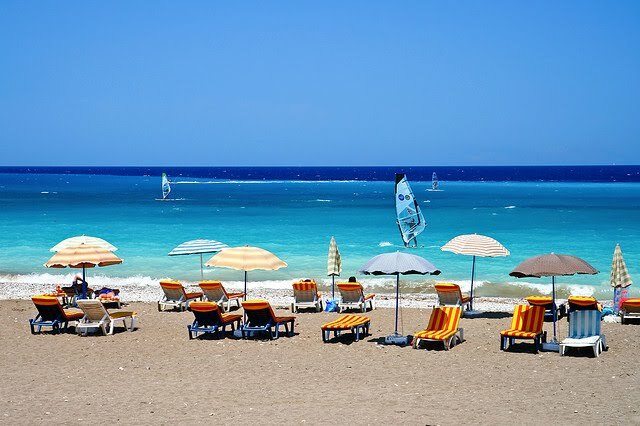 More than 5 kilometers wide,Faliraki is the most popular and the most highly organized beach on Rhodes. Faliraki is like one big funfair, with a vast, multiethnic crowd tirelessly in pursuit of pleasure, day and night – in the morning on the famous beach with its striped umbrellas, at night in the narrow streets with their garish neon lights and loud noise. Here you can find anything you can possibly ask for – water sports, cafeterias, night clubs, restaurants, bungee-jumping, places for shopping and more. Gennadi or Genadi is a coastal village with a great long beach at the south part of Rhodes, just after Lindos and Kiotari at a distance of about 60 km from Rhodes capital. The peaceful beach is mostly sandy and partly from white small pebbles. Gennadi offers a fair amount of taverns, restaurants, hotels and rooms to let. For windsurfing the distance from Prassonisi is about 16 Km. Recently Gennadi became the spot for some great dj beach parties held there on Sundays. Kolymbia (Kolympia) is a beach resort located in the midle of the distance between Rhodes and Lindos, at a central location to explore Rhodes. Those that visited Kolymbia will remember the Eucalyptus road leading to the beach from the main road with the big trees on both sides. At the south edge of the beach there is a fish tavern and afterwards a small fishing bay and port (Limanaki in Greek) with a chapel. Kolymbia is ideal for families and those wanting to relax and enjoy the sea. Afandou is wonderful long beach (more than 3 km), that lies at a distance of about 20 from Rhodes town and 4 km from Faliraki beach. It is a pebble beach with crystal clear waters. A sandy beach with some pebbles, and sea that deepens quite abruptly.There is a small number of small restaurants, beach sports centers and fish tavernas. Ixia lies at the North West part of Rhodes at a distance of about 7 Km from the city of Rhodes close to Rhodes International Airport. Some of the best hotels in Rhodes can be found here. The beach is mainly organized and during the summer season it gets rather windy with large waves, so is suitable for wind surfing and sailing. Ixia also offers spectacular sunsets! At Kalithea bay the Italian spa Facilites, the exotic Vegetation and the sea are combined to a picture comming right from the cinema. The Kalithea spa Building complex is a distinguisshed Cultural Monument.Especially outside the high season, this is the favourite spot for local people looking for a quick swim. However, You should not confuse it with the minibeach below the Baths, which is full of visitors who come in little boats from Rhodes town to admire the amazing facilities of the Baths, currently under renovation. Stegna is a beautiful small beach with mixed sand and pebbles in the area of Archangelos (500 meters along the road) at a distance of about 32 kms from Rhodes Town on the east coast. The beach is quiet with a family atmosphere and unspoilt, only partly organised with umbrellas and sunbeds. There are several taverns some bars around the small fishing boats port of Stegna, water sports and rooms to let. Under the same blue of the sky of Rodos, but different, untouched still, with its own atmosphere, the southern part of the island lies in wait for visitors, to delight them with its own special charms. In its hospitable small villages the people know how to enjoy life with simplicity and verve and how to keep alive their age-old traditions. Prassonisi lies on the southern tip of the island, it is accessible by jeep and is considered to be a windsurfer’s paradise. The beach of Lardos bay is located at a distance of 65 km from Rhodes city, 6 Km from Kiotari after Pefkos. The beautiful sandy beaches of Lardos are known as some of the best beaches on the island. Crystal clear waters, and gently rolling surf make for an idyllic atmosphere for fun in the sun, or relaxing on the many sun beds under the shade of an umbrella. Also, there are many Tavernas along the beach where you can get a chilled drink or a quick snack while you soak up the sun. The picturesque Vlycha Beach, within easy reach of the historic town of Lindos, features everything you would expect of an idyllic beach: warm sand, crystal clear blue waters, plenty of sun beds and umbrellas and Canteens serving cool dinks and great tasting snacks. If water sports are what you are after, Vlycha has a good variety to choose from; everything from banana boat rides, to off shore snorkeling. Ladiko bay with the beautiful small beach lies at a distance of about 15 km from Rhodes town and just 3 km from Faliraki and is a must see in Rhodes. Small but rich. Fine sand, rocks the hidden beach in Greece with a fish taverna on the top. Tsambika (or Tsampika) is one of the most beautiful beaches on Rhodes. A long, broad beach with fine, golden sand and dozens of colourful little flags marking out the various eating establishments and beach sports centre. Natural stone surfaces ideal for reclining under the sun, pine trees reaching down to the water’s edge, emerald green water – Anthony Quinn certainly showed impeccable taste when he fell in love with its miniature bay. The beach is known today by the actor’s name since he bought this part of the island when filming “The Guns of Navarone” here. The waters owe their deep emerald colour to the kush green vegetation which surrounds the beach. It is one of the most beautiful beaches on Rhodes. Follow the sign for the beach and you’ll find yourself at the left-hand end, while if you go straight down below the Acropolis, down Pallas St., you will find yourself at the right hand end, known as Pallas Beach. Basically they are two different beaches sharing the same bay. Sun beds everywhere, umbrellas, tavernas, crowds of people – from groups brought by coach from other parts of Rhodes to Brits who settle in Lindos each year for the whole summer. Fine, wet golden sand and some canteens – this is the only thing you will find on Agathi. It is a beautiful, sheltered, cosy beach, and the only sign of civilization are its canteens. Camping is possible there, so take your sleeping bag and camp at the cave which is at the end of the beach. An ideal spot to spend the night. The beach consists of small light coloured pebbles and is boarded by crystal-clear waters. Only a small section of the beach is organized the rest is left in its natural state. In Traganou there is also a small fish tavern welcoming hungry bathers.